Inicio » Sin categorizar » 4 things you must do in the Canaries! The Playa de Maspalomas is on on Gran Canaria’s southern edge and is an idyllic spot for anyone wishing to enjoy the sun ans a beautiful beach. 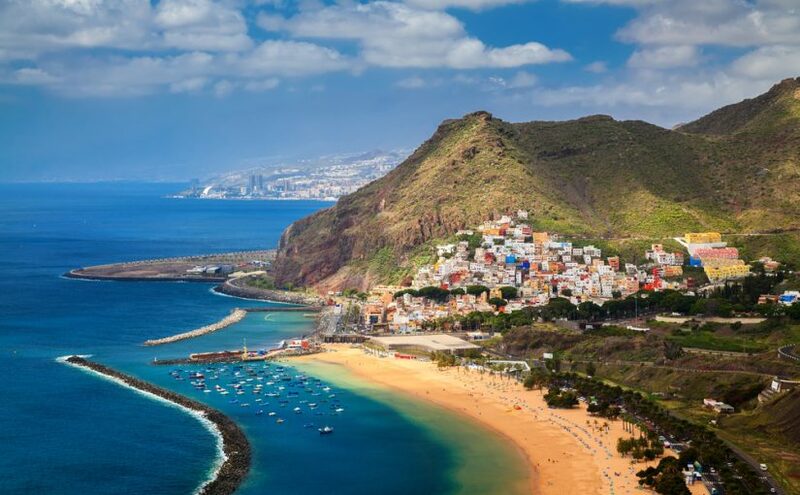 Not only is Las Palmas the Canaries’ largest city, it’s also got a big choice of things to do, especially its beach — the 2½-mile Playa de las Canteras — is a somewhere to head straight away. the waters are gentle and suitable for travellers of all ages and are protected by a barrier reef and once you’ve finished on the beat the prom is a great place for an evening walk. If shopping is on the agenda head for Triana and its surrounding streets as here you´ll find shops such as Zara and H&M, as well as more local boutiques. In the evening the atmosphere changes and the streets get busy with people. Head on down here for a lively and fun evening, it´s just 3 miles south of Playa de las Canteras. The city’s centuries-old Catedral de Santa Ana is well worth a visit too for its great views and neoclassical architecture. A rock formation rising more than 250 feet into the sky on Gran Canaria, Roque Nublo is a popular place for tourists. Taking a short hike (roughly an hour) from La Goleta car park you can reach the top and the views are amazing! Get their early to get a parking place as it get crowded at times but the hike up is fee and is well worth the effort. open daily and located at the centre of the island, about 30 minutes from of Las Palmas we would recommend this jaunt, the car park is inside inside the park on the GC-600 Road between Ayacata and Degollada de las Arenas. Covering almost 75 square miles in central Tenerife, the Parque Nacional del Teide boasts the towering Teide volcano, which is currently dormant. Rising 12,198 feet into the sky the volcano is Spain’s tallest peak and the world’s third-largest volcano Head on into the rest of the park and you will not be disappointed as its strange-looking rock formations and multicoloured lava deposits will amaze you!. Walk around on over 20 trails and bring your own vehicle to see the very best of the park. it´s open 24 hours a day and entrance to the park is free. And don´t forget, you can drive with all tranquility if you choose our service without Excess Insurance for your Canaries trip. If you want to have a great time in the Canary Islands you can´t miss these 4 things you must to do to enjoy your exotic holidays.